It’s summertime — and that means you’re probably enjoying cold treats like ice cream, popsicles, and big glasses of condensating lemonade. Or maybe you’re not. If you frequently feel like saying “ouch” in response to cold and hot stimuli, your gums may be to blame. Gum recession is common as we get older, as the healthy tissue disappears and leaves your sensitive tooth enamel and root exposed. Keep reading to find out why gum recession happens, and why it’s important to stop it, from your dentist in Sapulpa. Having plenty of healthy, pink gum tissue is crucial for your healthy and long-lasting smile. You may not think about your gums as much as you do your teeth when it comes to oral hygiene, but keeping this tissue clean is VIP. Gums keep your teeth sturdy and right where the should be. Plus, as the gateway to the rest of your body, your periodontal (gum) health is closely linked to your overall well-being. People who have gum disease are more likely to have diabetes, heart problems, and other issues with general health. The gums may recede for a number of reasons, from your oral hygiene techniques to certain lifestyle habits. The most common causes of gum recession are listed below. 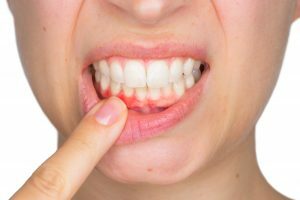 Aggressive tooth brushing: It may feel like you’re getting your teeth really clean when you brush in hard, back and forth strokes, but you are actually damaging your sensitive gum tissue and causing it to pull away from where it should be. Gum disease: If the periodontal tissue becomes infected, you have gum disease. The infection will gradually eat away at the healthy periodontal tissue, robbing your teeth of their sturdy foundation and eventually causing tooth loss. Smoking and tobacco use: This habit isn’t just bad for your overall wellbeing, it can harm your smile health as well. Plus, if an infection does develop, tobacco use will slow your body’s ability to heal itself. Teeth grinding: Repeated pressure placed on the teeth with nighttime teeth grinding and clenching can lead to gum recession. The treatment for your gum recession depends on how severe it is. It’s a good idea to schedule an appointment with your dentist to talk about the best course of action. For minor gum recession, you may just need to tweak your habits to rejuvenate what has been lost. In cases of more significant recession, however, a gum graft may be needed. This is a procedure a qualified dentist, periodontist, or oral surgeon can perform. Healthy gum tissue is taken from elsewhere in the mouth and placed into the area where it has been lost. No matter what the best method is for your gums, the important thing is finding a solution right away! Don’t hesitate to get in touch with your dentist if you are experiencing gum recession. Complete Cosmetic Care Dentistry offers comprehensive dental care for patients of all ages in their Glenpool, OK office. If you are struggling with gum disease or gum recession, their team can help you effectively manage these issues. Do not hesitate to get in touch with them by calling 918-216-1000 today.